It is Easter vacation, so the family drives to the cabin for a week. They color Easter eggs, go on an Easter egg hunt, and find their Easter baskets. 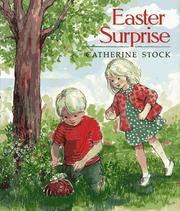 Stock, Catherine, “Easter surprise,” Children's Picture Book Database at Miami University, accessed April 23, 2019, https://dlp.lib.miamioh.edu/picturebook/items/show/9184.